A year and a half ago, Chris Durkin went with the USA U-17 team to the World Cup in India and appeared in all five games. 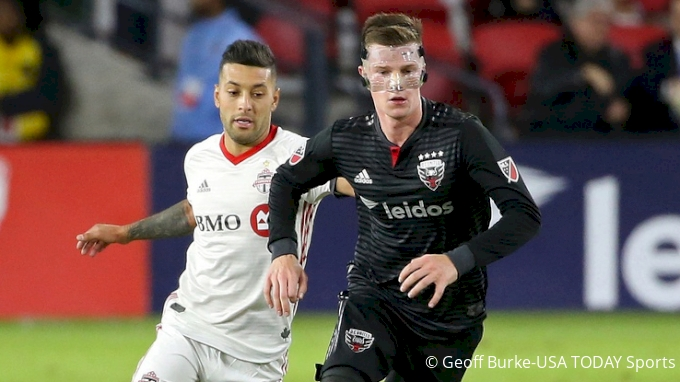 Durkin had signed with D.C. United in June 2016 but had spent most of his time away from the club, either with the U.S. team or playing games in USL with the Richmond Kickers. It was part of United's plan for the defensive midfielder from the Richmond, Virginia, area. Now, with just a couple of months before this year's U-20 World Cup, Durkin is headed to Spain for the U-20 camp with friendlies against Japan and France. The call-up is a continuation of Durkin's progress since he was signed by the Black-and-Red nearly three years ago. Should he be part of Tab Ramos' final squad to go to Poland at the end of May, he'll get another chance on the international level to show off the skills that have earned him plenty of plaudits stateside. "It’s our last camp before the U-20 World Cup. It’s something that I’ve had my eyes on for a long time," Durkin told FloFC on Saturday night after he made a substitute appearance in United's 5-0 win over Real Salt Lake. Durkin wasn't part of the squad that qualified for this summer's tournament during the 2017 CONCACAF U-17 Championship back in November. The first game of that tournament was the start of the MLS playoffs, which ruled Durkin out. United's playoff appearance was short-lived, but the U.S. waltzed through qualification and won the championship by defeating Mexico 2-0. Now, as part of their final camp, the U.S. will face off against Japan and France in Spain, two countries that will also be present in the U-20 World Cup. Those two games will be a good way for the U.S. to gauge themselves ahead of a group with Qatar, Nigeria, and Ukraine. "It’s a great test against Japan and France, two World Cup opponents," Durkin said. "Time to get back to work with Tab, and great to be back with all the boys over there in Spain." In his last international tournament, Durkin split time between center back and defensive midfielder for the U.S. in the 2017 U-17 World Cup. He scored in the opener against hosts India and was on the field for all five games, earning plenty of praise for his performances. The U.S. won three of their five games, falling in the quarterfinals to eventual champions, England. Following that tournament in October 2017, Durkin had a bigger role with United in 2018. With Junior Moreno and Russell Canouse out for a big portion of the season, Durkin was relied upon as the team's defensive midfielder. He logged 23 games, 16 of which were starts, eclipsing 1500 minutes in 2018. This year, he has two substitute appearances through three games, with a total of 17 minutes. Maybe not quite where Durkin would want to be after last year, but United still think highly of their 19-year-old homegrown player. After 17 minutes in the big win over RSL, Durkin was happy to have played part in the game. "For me, to play a part in that, and step on the field, it feels good," Durkin said. Back in January, news was made when the Philadelphia Union made it seem like defender Mark McKenzie, who played in the Concacaf U-20 Championship in November, might not be released for this May's World Cup. That raised a few eyebrows, but it doesn't appear that United has any issue with Durkin going and proving himself on an international level. As the start of the tournament doesn't fall in a FIFA international window, teams aren't forced to release players for the tournament. But according to Durkin, there won't be any questions about his availability if called upon. "Me and the staff have talked about the World Cup, and I’m really looking forward to it," Durkin said on Saturday. There have been rumblings over the years about interest overseas for Durkin. So far, D.C. has resisted any offer that might have been on the table. But the U-20 World Cup is closely followed by many around the globe, as a way of scouting upcoming talent. Should Durkin feature as much in this year's tournament as he did in 2017, he might just catch a few more eyes, including the senior U.S. team. "I put my toes in the water with the U-17s, but I know the U-20 World Cup is going to be an even bigger showcase," said Durkin.